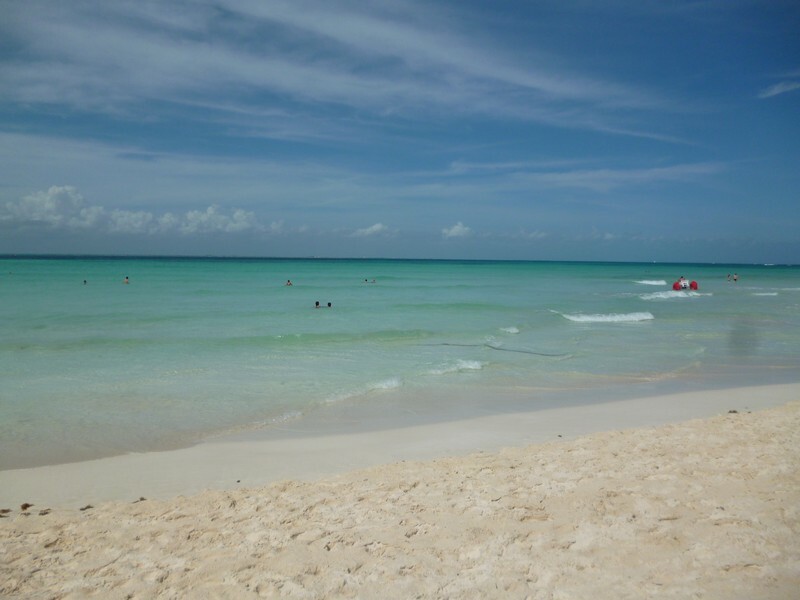 So after Tulum it was off to Isla Mujeres for a few more days on the beach. We’ve had the last of our long journeys, from now on it’s just a couple of hours between the various beaches in the Yucatan. We get off the bus in Cancun, after passing mile after mile of massive beach resorts. And when I say massive I mean absolutely humungous – these things are the size of small towns. Yuk. From the bus station it’s a short hop in a taxi to the ferry port and then a quick 25 minute ride out to the island. Ferries go every half an hour from 5am to late at night so there’s no need to book tickets in advance, just rock up and away you go. The Stefs are staying at Poc Na, one of the few proper hostels on the island, whilst we’re in a small hotel in the centre of town. Before long, we bump into them in the street (the place really is that tiny) and agree to meet that evening for drinks. We hook up later at the Rock Bar, which starts off a great night with good indie music but slowly goes downhill when a couple of guys (one of them the owner of the bar) decide to show off their guitar playing and singing skills. I use the word skills loosely, it was pretty cringeworthy to watch and the only person that seemed to be enjoying it was the younger guy’s girlfriend. You know those people on X Factor who think they’re really good but are actually pretty appalling? Well enough said. Still, it was great to catch up again with the Stefs and we got introduced to a couple of lovely girls they’d met since being on the island. After some more beers and tacos for dinner, it was off to bed with plans for the beach the next day. Sure enough, the weather was much better in the morning and we headed down to Playa Norte to soak up some rays. It’s a beautiful beach here, the same white powder sand as in Tulum but with less sea grass and possibly even warmer water. After maybe half an hour lying on the sand we couldn’t bear the heat any longer as it was impossibly hot so treated ourselves to some sun loungers and umbrellas. Later our pasty skins managed to endure a little more tanning whilst sipping some Flor de Cana we’d bought. Mmmm. Later, despite the previous evening, it was back to the Rock Bar, along with some more recruits from Poc Na. It was our last night with the Stefs so we were a little sad but all good things must come to an end. Apart from that, it was a fairly uneventful few days mainly consisting of lazing on the beach. We were lucky with the weather and although we had a few clouds we didn’t get any more rain. We’re definitely winding down now before we head home so there’s no more big sights to see or tours to go on, just a bit of relaxation before heading back to the English winter.